This week we’re going to talk about communicating with crystal. In order to better understand what I am talking about in communicating with crystal, we will delve deeper into this concept of what I am calling “clairs”. COMMUNICATING WITH CRYSTAL: WHAT ARE “CLAIRS”? When it comes to communicating with crystal, it helps to know which “clair” you are. What do I mean by a “clair”? This is a shorthand I use to describe the different alternate ways we use our non-traditional senses. 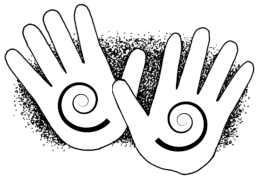 Clairvoyant = clear seeing, Clairaudient = clear hearing, Clairsentient = clear feeling, or Claircognizant = clear knowing. Everyone tends to work with one of these “clairs” more easily than the others. Some people are fortunate to be equally in touch with many of them at once. Clairvoyant people tend to “see”, either in their mind’s eye or with their physical eye. Clairaudient people tend to “hear”, either bells or ringing tones, verbal messages or other auditory sensations. Clairsentient people tend to describe in “feeling” terms. For example physical sensations in the body or emotional feelings. Claircognizant people tend to just know something (with no external clue as to why they now know this). Most people do what I describe as “stacking” their “clairs”, even if they don’t actually realize they are doing this. This means that we all have the ability to sense in all four of these ways. However, we tend to be dominant in one or more areas, in sort of a hierarchy. For instance, I tend to be primarily Clairsentient. First, I FEEL. Next I am Clairaudient. I will sometimes hear tones or buzzing, and often hear voices or commentary. I can determine that it is not my internal dialog because the cadence of the voice changes and I get a feeling in my body that is different. This is what happens when I channel my Crystal Guide, Venus. My next layer would be Claircognizance, or clear knowing. I just tend to know something is right or rings true. Finally I am Clairvoyant (which remember is clear seeing). I do tend to see things, but it is below my other senses. The hierarchy can and does change, these are not set in stone. Work with the areas in which you might be weaker and help build that “muscle”. IN WHICH “CLAIR” ARE YOU DOMINANT? Sometimes people think that communicating with crystal is beyond them. That because they don’t “feel”, “see” or “hear” what someone else is describing, they think they are not capable of “getting” it. This couldn’t be further from the truth. It is a matter of figuring out in which channel you are strongest. How might you know which of these senses is more prominent for you? I like to look at how a person phrases their answer to a particular question (see how you tend to respond, without thinking about it). A Clairvoyant person (clear-seer) might say “I don’t see it”, “This looks all wrong” or “I can see what you are talking about here”. They tend to answer in ways that describe seeing something. Perhaps they run a visual assessment in their mind’s eye, but their responses tend to be based on seeing. 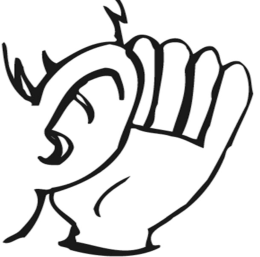 A Clairaudient person (clear-hearer) might say “This doesn’t sound right”, “That rings true” or “He sounds like an upright guy”. They tend to describe things in examples related to hearing. A Clairsentient person (clear-feeler) might say something like “I’m just not feeling it”, “This doesn’t feel right to me” or “This feels good” or “That person just feels off”. They are using descriptors based on feeling or sensations they read in their bodies. A Claircognizant person (clear-knower) might say “I don’t want to do that (I don’t have a reason)”. “This is wrong (I can’t explain why I know, I just do! )”… “That person isn’t being truthful (I don’t have any specifics, I just know they are lying!)”. They have solid opinions/knowings without an obvious reason other than they just KNOW! HOW DO THESE DIFFERENT “CLAIRS” WORK IN REGARDS TO COMMUNCATING WITH CRYSTAL? The clairs work like radio signals. Quartz crystal is broadcasting on all frequencies at all times. It is up to us to determine which is our strongest “clair” and tune into that channel. Easy! Like I said, many people operate with many of their “clairs” layered, and they juggle around (switch places of importance) with all of us. Figuring out your primary “clair” is just a jumping off place. This is why it will help you to know which “clair” you tend to be mostly. 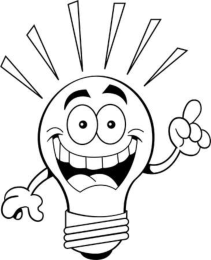 The person teaching you (either in a book or in person) might be operating from a different “clair” than you. Don’t assume that you just aren’t able to communicate with your crystal because when they ask “do you FEEL that! ?” (you don’t) or “do you HEAR that buzzing or SEE that light?” (you don’t). 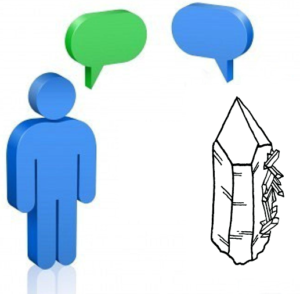 It isn’t because your crystal isn’t speaking to you, you are just on a different channel than the person describing the possible interaction. Rest assured that your crystal is ABSOLUTELY talking to you, it is just your job to tune into the clearest channel for YOU. The beauty of communicating with crystal is that all you have to do is tune in to the “station” that is strongest for you. The crystal is broadcasting all of these signals for us: visual, auditory, sensory, knowing (and probably more of which I am not aware!). 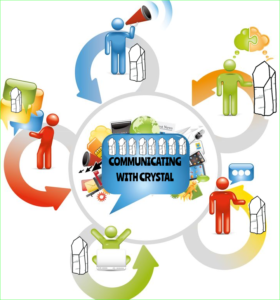 Hopefully this will alleviate any doubt you have acquired over the years of thinking that you “can’t communicate with crystal”. It is very possible that the people you have been learning from were simply using descriptors from a different channel than you resonate with. Also be aware that sometimes the input is very subtle and can be easily missed. If you have a lot going on in your mind or body, you might not be able to hear (see, feel, know) the message until you get your internal chaos stilled (or at least become aware of the fact that there IS chaos). This is where the “check-in” from the previous post about working with your crystal is most important and a step which you should not skip. Determine your baseline and then notice what is different when you pick up your crystal. That is you, communicating with crystal! Determine in which of these ways of sensing you tend to be dominant. Are you typically clairvoyant (a clear “seer”), clairaudient (a clear “hearer”), clairsentient (a clear “feeler”) or claircognizant (do you just “know”)? When you read a book or take a class about quartz crystal, if the author or teacher tends to speak more heavily with descriptors from one of these areas, you will be better able to see that you ARE communicating, but it might not be in the same way as them. Use your knowledge of your stronger suit to “translate”. For instance, another person “hearing” a bell tone might translate to you “seeing” a bright light or “feeling” a lightness or simply “knowing” this crystal is bringing light or a higher vibration. In the next post, we will cover a way to access more information from your crystal friend when you work together. If you have questions or comments, please feel free to add them below! Tagged communicating with crystal, crystals, how to. Bookmark the permalink.